Iv got a problem with the queuesound function. queueSound is called on a streaming source or the MIDI source. It queues up the next sound to play when the previous playback ends. There are two versions of the method, with parameters that are similar to the first couple parameters of newStreamingSource (so if you know how to create a streaming source, you should have no problem using queueSound). As stated in the JavaDoc, this method has no effect on non-streaming sources. import paulscode.sound.codecs.CodecJOrbis;Can you help me with this? Put the source files into a package with the specified name/path as in the import statements. paulscode/sound, paulscode/sound/libraries, and paulscode/sound/codecs are the three you have listed below. Or if you are using the compiled JARs, include them like any other JAR you would add to a Java project. Not sure. That is the correct path. The other four imports work? Hello! nice library you've got going here! I was wondering if you're planning on making the OpenAL plugin compatable with lwjgl 3.0? As far as I know, the lwjgl-team hasn't changed the openAl interface very much, and I think there's only a few lines of code that needs changing. It would be great if you did! Maybe you should update the few lines about the JOAL plugin because it uses both OpenAL and OpenAL-Soft under the hood which drives it more compatible. I'd like to build your library with the profile "compact1" but there is only one class preventing me from doing it: javax.sound.sampled.AudioFormat. As this class is just a bean (there is no intelligence in it, it contains only some fields and some accessors), maybe it would be acceptable to replace it by a more simple class or by the implementation of this class in Apache Harmony so that I can use your library even under Android. Finally, I see that you're on Github. Why not putting the source code of your sound system into it? It would help me to contribute. it seems that windows 10 doesnt have the "Microsoft GS Wavetable synth"
The solution to this will likely be the same solution as the problem with only having one line on Linux, which is to write my own software mixer. Been meaning to do that, but haven't had much time for programming in a while. First, thank you for your work on the 3D Sound System. It must be quite popular since Minecraft is using it. sequenceQueue is null if you are not using it before and that means a NullPointerException is stopping the loop from working. 1. In MidiChannel always add parameter false when fetching the Sequencer (MidiSystem.getSequencer(false)). False means to not connect to a Synthesizer, which is done later anyway. If not given this parameter the output is terrible, at least in java 8. I guess this is because there is more than one Synthesizer connected. 2. I found out that on my system the volume control is not on controller 7 but on controller 11. I don't know if this is always the case but it worked for me. Now I set the volume on both controllers (method resetGain). Hello. Thanks for your great library. I've created a preliminary Android port using Android's AudioTrack class. This is still very early state but it can play some music. 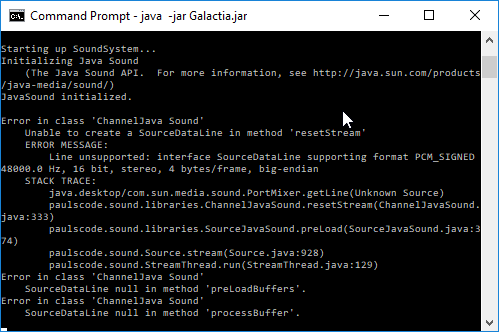 The main library has some API changes required for Android, like adding the clone of JavaSound's AudioFormat class and adding the ability to override how InputStreams are obtained from URLs (useful for Android asset). Any suggestions, forks, bug reports and fixes are welcome. Love the library system you have going, it's very cool. But I'm having and issue at the moment. 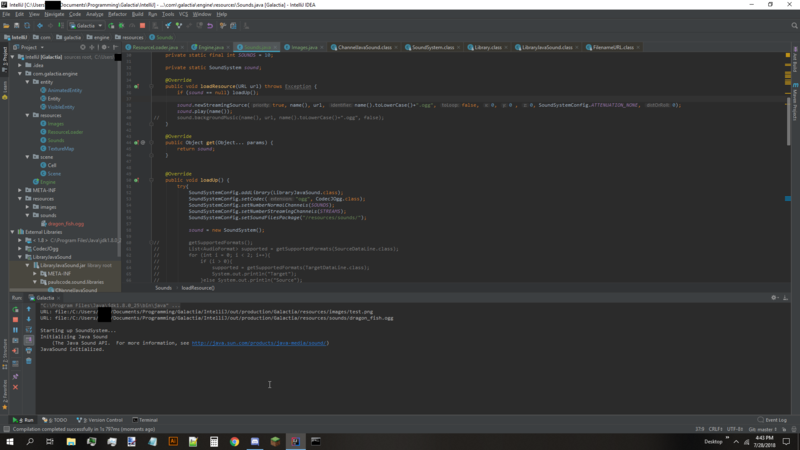 I can play sound in my IDE, but as soon as I package the jar and try to run it, I get a stacktrace. Please help? Hm, weird that it works in the IDE but not outside of it. Are there different versions of Java between the two runtimes? Good call, I didn't think about that, but as soon as you said it, it made sense. I'm running java 10 on my system I guess. Is their a way you could update the lib to make it compatible? Or where would I start for a work around? Thanks again!